I just had too many cucumbers that had been sitting for a while, nearing the end of their lives. I found this recipe that worked pretty well and decided to keep it for variety. What makes it fancy is that the cucumber has been cut with a potato peeler. What makes it tasty is the dressing! Credits for the inspiration go to a post made by Mpourek at sintagespareas. How to make: Blend all the ingredients until they are well combined. Peel and discard the skin of the cucumber. 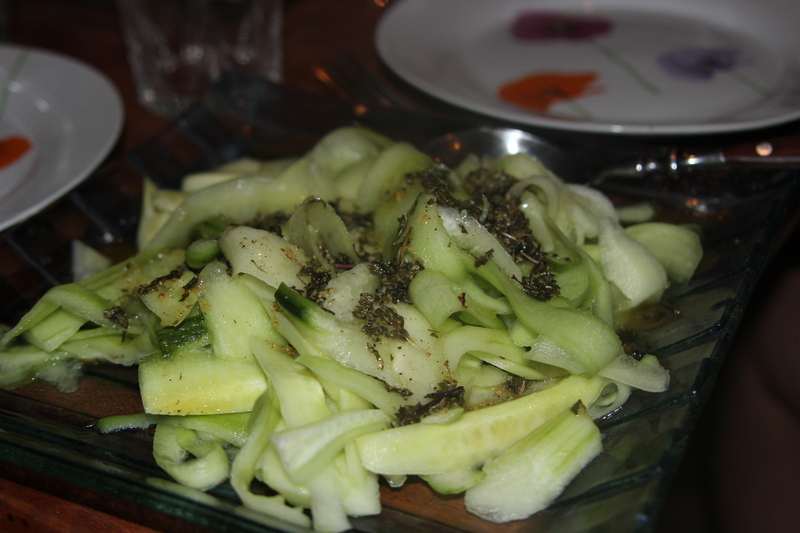 Now use the peeler to create long strips of cucumber. Put in a serving dish and add the sauce on top. Notes and tips: For this recipe, I used dry spices (mint and ginger), but, of course, it’s better to use fresh.